Imagine starting your day, café au lait in hand... in Monte-Carlo on the Côte d’Azur... as you cruise aboard an elegant riverboat on the Rhône for... a walk through picturesque places painted in time like van Gogh’s Arles... a tour of a palace for popes in Avignon and at vineyards dedicated to their revered wines... shoreside excursions in Roman Vienne and medieval Viviers... culinary treats in Chalon-sur-Saône and Lyon... dinner at an acclaimed Paul Bocuse eatery... dressage in Cluny... wine tastings in country châteaux... ending with art and champagne during two fabulous nights in Paris. Tauck’s cruise-tour begins at 6:30 PM at the Fairmont Monte Carlo. A transfer is included from the Nice Cote d’Azur Airport, Nice Ville Train Station and Nice Riquier Train Station to the Fairmont Monte Carlo; guests in Category 7 aboard the riverboat will enjoy sea-view rooms in this world-class hotel on Monte-Carlo's famed waterfront. Join us for a cocktail reception and dinner here in Monaco as we welcome you to one of our popular river cruises in France. Stay in Monte Carlo for two nights at the Fairmont Monte Carlo. It’s hard to imagine a more idyllic or sophisticated place than Monte-Carlo; it brings to mind jet setters, mega-yachts bobbing in the harbor, the glittering casino where the rich and famous play, and the fairy-tale legacy of Princess Grace, Prince Rainier and the Grimaldi family who have ruled the Principality of Monaco for over 700 years. It’s all part of the magic you’ll discover – along with Monaco’s cathedral, the Place de Palais and more – on a morning orientation tour and time on your own. Today you’ll discover why Nice is a perennial favourite of sophisticated travellers. Go on a city orientation walking tour this morning, followed by time to explore as you please. You might choose to stroll the Promenade des Anglais, winding its way along the shore of the beautiful Bay of Angels, or the medieval streets of Old Town that make Nice so nice. Early afternoon, travel to Arles, where you'll board ms Swiss Emerald and begin one of Tauck's most popular river cruises in France along the Rhône and the Saône. The crew welcomes you aboard with a reception followed by dinner this evening. It may seem strange to encounter Roman ruins in Provence but Arles was, after all, once a Roman city; while the gladiators are gone, the arena they left behind – just one of the town's many Roman remnants – still hosts performances and bullfights today. Explore Arles' medieval streets and city walls and be sure to look out across the surrounding countryside to what van Gogh found so enchanting. It's off to La Camargue, France’s "wild west," where cowboys tend to herds of bulls destined for bullfighting rings in Spain. Visit a working farm to see what these cowhands and their charges do during a demonstration – not something usually experienced on France river cruises – followed by lunch featuring traditional Provençal fare and entertainment. The fortified city of Avignon was probably a much more peaceful place before Rome became "inconvenient" for the popes who moved the papacy here about 700 years ago. Although they stayed for less than a century, they kept busy during those years... as you’ll see on your visit to the impressive Palais des Papes that they built for themselves during this morning’s sightseeing in this key medieval city. After a free afternoon aboard ship, travel to the Duchy d'Uzès – a medieval city dating back to the 11th century, often called the “First Duchy of France,” that forms the heart of the town of Uzès – for a guided visit followed by a cocktail reception and a Tauck Exclusive gala dinner at the recently restored Chateau. With your riverboat docked in Avignon for the morning, you can spend more time exploring the medieval city or take a morning excursion to Saint-Remy-de-Provence – home to the ruins of the Roman city of Glanum, as well as the Saint-Paul Asylum where Vincent van Gogh was a patient. 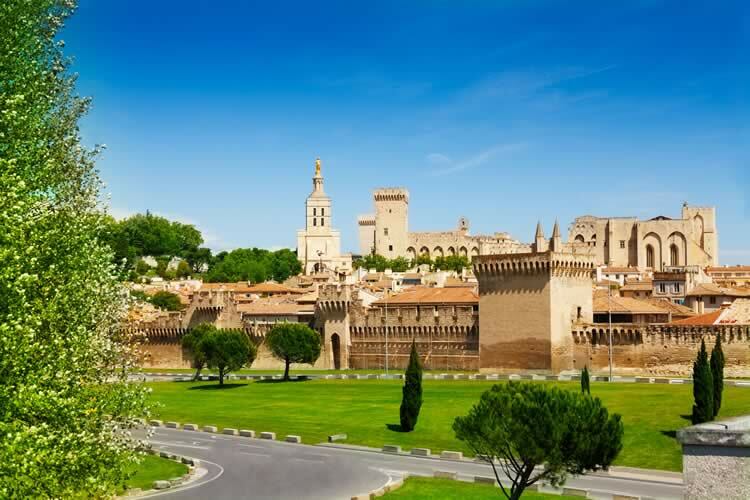 After returning to the ship for lunch onboard, head out again for an afternoon wine tasting at one of the select vineyards permitted to produce Châteauneuf-du-Pape – literally “the New Castle of the Pope” – the most famous of the Côtes du Rhône wines; your host reveals secrets of the terroir as you sample estate-crafted red and white wines from a region that's been producing wine for more than 2,500 years! Catch up with the riverboat in Châteauneuf-du-Pape and spend the evening onboard. It seems that the Romans were everywhere along the Rhône, and Vienne (which they called "Vienna" in their day) was no exception. During your time on a walking tour here this morning, look for the theatre and temple they left behind, as well as other sights straight out of history. You'll also travel to Mont Pipet for extensive views of the surrounding countryside. Alternatively, you may instead choose to join a guided bicycle tour following the Via Rhona along the River Rhone. Return to the riverboat this afternoon to continue your cruise. Your riverboat arrives in Mâcon on the Saône River this morning, for exploration in Cluny. During the reign of Charlemagne (742 - 814), monastic influences inspired a great revival in art, education and culture; today you'll visit one of the great monasteries of the period when you tour the great Benedictine Abbey of Cluny. Founded in 910, it was at the center of this major monastic reform movement and was also the largest Christian building in the world until the construction of St. Peter’s Basilica in Rome. You'll also visit Haras National de Cluny (France's national equestrian center), which dates back to the 19th century, to learn about its high-quality thoroughbred stallions. Have lunch off the riverboat today; later, reboard ms Emerald and enjoy onboard entertainment after dinner as you cruise to Chalon-sur-Saône. Chalon-sur-Sâone on the River Saône lies in the heart of southern Burgundy. Although its history dates back to the time of Charlemagne, it has another significant claim to fame – this is considered the birthplace of photography. So you have local inventor Nicéphore Niépce, who started it all with several photographic firsts right here in the 1820s, to thank for the great photos of the town’s Romanesque churches and other monuments you’ll take during a walking tour. Then get your taste buds ready for a workout – first to savor local culinary offerings on a guided tasting tour of some of Chalon-Sur-Saône’s noted food shops, from an artisan chocolate boutique to a splendid pâtissierie; then for a wine tasting at a private vineyard on a grand family estate along the Route des Grand Crus in Mercurey, the largest wine-producing area in the Côte Chalonnaise. Return to the ship for dinner this evening. After cruising the Saône overnight, ms Emerald calls on Tournus this morning, from which you'll head out to explore the beautiful wine producing region of southern Burgundy, where history lies around every corner (this was a major crossroads during Roman times), and vineyards are everywhere. Picture in your mind what a typical French vineyard looks like... and then view the most amazing landscape that surrounds you for miles and miles. Vineyards, gently rolling hills, orchards, red-tiled farmhouses, medieval cathedrals, the occasional village to stop in... and historic country estates like the 17th-century Château de Cormatin, which you'll explore on a visit today. With its moat, drawbridge, turrets, gilded rooms and parklike grounds – including the mazes and fountains of its completely restored "pleasure garden" that's now among the finest in France – this classic Burgundy château takes you back through the centuries. Return to the riverboat in Tournus for lunch, and continue your cruise this afternoon and evening to France's culinary capital, Lyon. Ahh, Lyon. If you’re a serious foodie, Lyon is the place for you! But of course there is more to this 2,000 year-old city, a UNESCO World Heritage Site, than food. Your day includes getting a panoramic view of Lyon from the hilltop district of Fouvière; a visit to the stunning Basilica of Notre-Dame-de-Fourvière – built in the 1870s on “the hill that prays," it features exquisite marble work, stained glass windows, colourful mosaics and gilt galore; a tour of medieval Vieux Lyon; and a free afternoon to explore more of the city as you please. As ms Emerald spends the night docked in Lyon, join us aboard ship for our farewell reception followed by dinner this evening. Ernest Hemingway called Paris a “movable feast" – and even if you’ve been here many times, today might be the day that you discover something about the city that you didn’t know before. After a guided tour this morning to help you get your bearings, the rest of the day is free to explore and enjoy as you please. We’ve included admission to your choice of museums from a selection of the city’s best, including Musée National de l'Orangie, Musée Rodin and Musée d’Orsay (subject to availability). Tonight, we'll all gather for a memorable farewell dinner at chic Fouquet’s, the quintessential Paris brasserie on the Champs-Élysées; elegance and classic cuisine have made it a celebrity favourite for more than a century! This most memorable of river cruises in France ends in Paris. Fly home anytime. A transfer from InterContinental Paris Le Grand Hotel to Charles de Gaulle Airport, Gare de Lyon Station, Charles de Gaulle Station and Gare du Nord is included. Please allow a minimum of three hours for flight check-in. We wish you a safe and pleasant journey home. All private Tauck shore excursions – £1,300 Value!